Director – Douglas Hickox, Screenplay – Charles Edward Pogue, Based on the Novel by Sir Arthur Conan Doyle, Producer – Otto Plaschkes, Music – Michael J. Lewis, Special Effects Supervisor – Alan Whibley, Makeup – Tom Smith, Production Design – Michael Stringer. Production Company – Sy Weintraub. 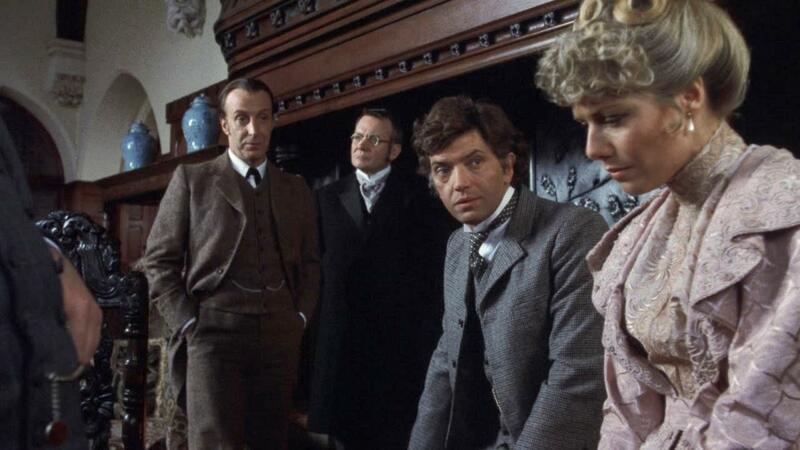 Sherlock Holmes and Dr Watson receive a visit from Dr Mortimer from Devonshire who tells them of the curse of a ghostly hound that kills all the members of the Baskerville family line. The hound appears to have been responsible for the recent death of Sir Charles Baskerville. His heir Sir Henry is now about to arrive from America and Mortimer fears the same fate will befall him. As Holmes investigates, some agency seems to be trying to kill Sir Henry. Holmes sends Watson on alone to Baskerville Hall where he becomes embroiled in the doings of a number of mysterious figures lurking about the estate and moors. At the same time, a glowing, ghostly hound seems to be trying to kill Sir Henry. Following his first appearance in the novel A Study in Scarlet (1887), published in Beeton’s Christmas Annual magazine, Sherlock Holmes has indisputably become one of the iconic characters of popular fiction. Almost every detective story since then draws on the model that Arthur Conan Doyle (1859-1930) set down of the detective as ratiocinator extraordinaire. During his lifetime, Doyle wrote 57 Sherlock Holmes short stories and four novels (although there have been a myriad of Holmes pastiches from other writers since then, not to mention over 250 different actors playing the part in numerous films and tv series). The Hound of the Baskervilles (1902) was the third of the canonical Sherlock Holmes novels. Holmes is off-stage for a good part of the book and Dr Watson becomes the lead character, yet, unlike Conan Doyle’s other Sherlock Holmes novels – A Study in Scarlet, The Sign of Four (1890) and The Valley of Fear (1914) – which barely seem able to muster three adaptations apiece, The Hound of the Baskervilles has proven the most popular of Arthur Conan Doyle’s Sherlock Holmes novels to be adapted to the screen. (See bottom of the page for the other adaptations). The rights to the book were obtained by US producer Sy Weintraub, most known for producing seven fairly good Tarzan films during the 1960s. Weintraub planned to make a series of theatrically released Sherlock Holmes films that adhered closely to the original Conan Doyle stories. This resulted in The Hound of the Baskervilles and the subsequent The Sign of Four (1983), which also starred Ian Richardson (although recast Dr Watson with another actor). However, the rights to the Sherlock Holmes stories had just come into public domain in England in 1980 (fifty years after Conan Doyle’s death) and Granada Television started up their The Adventures -, The Return – and The Casebook of Sherlock Holmes (1983-7) tv series starring Jeremy Brett. Weintraub was reportedly unhappy about this and cancelled plans to make any further films. The Hound of the Baskervilles did receive some limited theatrical screenings but was mostly seen by the rest of the world as a tv movie. Sy Weintraub and co deliver a solid and effective adaptation of the Conan Doyle novel. Charles Edward Pogue’s script follows the text of the original point for point in almost every regard – and more so than any other version of the story seen to date. About the only area I picked up that it strays from the text is the inclusion of Inspector Lestrade – Lestrade does turn up much later in the book but the film adds several meetings between Watson and Lestrade in the village post office, which are played for comedy. In many regards, this version of the story is surprisingly traditional. 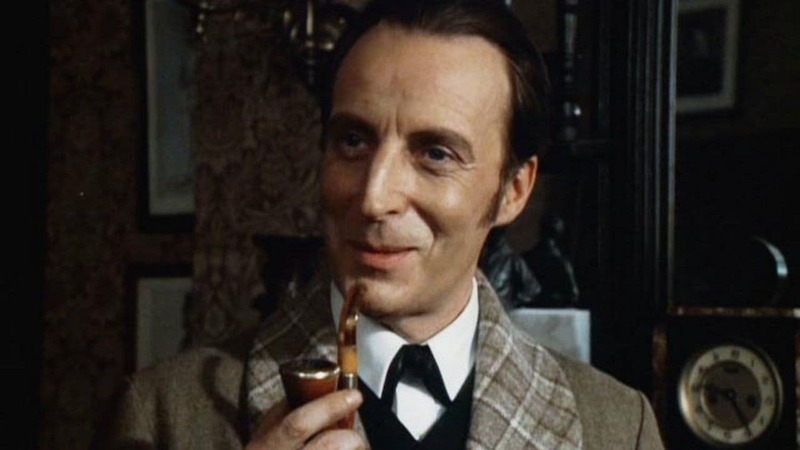 Ian Richardson has clearly modelled his performance on Basil Rathbone in the Universal Sherlock Holmes of the 1940s, giving us a traditional Holmes with a piercing intellect and as a jolly man of the British aristocracy. By contrast, other adaptations from this point onwards tend to amplify Holmes’s psychological quirks or make him rude and intolerable. Donald Churchill’s Dr Watson is still portrayed as the same middle-aged old duffer that he was in most Holmes adaptations up until the 2000s. Sy Weintraub and co have shot the film with a series of lavish period dressings and costumes, heading to real country estates and the moors of Devon to stand in for the locations. The only aspects that seems slightly setbound are some of the clearly indoor locations for Grimpen Mire. Douglas Hickox tells the story with good dramatic flow, even if at the end of the day what we get feels like a good and worthwhile version of the Conan Doyle story but never something that is anything more than that. One of the things that impresses about the film is that Weintraub has mounted it with a sterling cast line-up from the British acting profession of the day, including Ian Richardson, Denholm Elliott, Ronald Lacey, Brian Blessed, Edward Judd, Nicholas Clay, Martin Shaw who was a dashing handsome lead on the basis of the tv series The Professionals (1977-83) and Connie Booth, John Cleese’s former wife, best known for her role on Fawlty Towers (1975-9). Director Douglas Hickox had previously made the rather funny screen adaptation of Joe Orton’s Entertaining Mr Sloane (1969) and the horror film Theater of Blood (1973) with Vincent Price as a mad Shakespearean actor. Charles Edward Pogue was an American writer who delivered his first screen credit here and subsequently went on to write a number of other films including David Cronenberg’s The Fly (1986), Psycho III (1986), DragonHeart (1996), Kull the Conqueror (1997) and Hercules (tv mini-series, 2005). 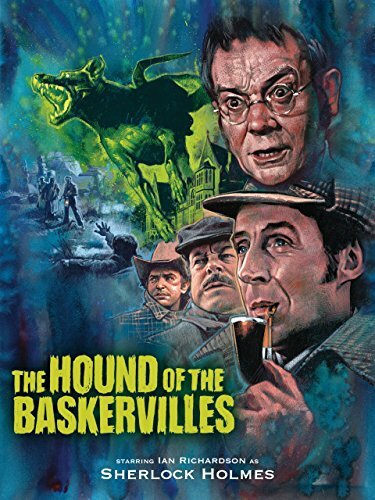 Other adaptations of The Hound of the Baskervilles include:- a series of six German films released under the same title between 1914 and 1920, which were made by two different companies when one director defected and both companies kept making rival sequels. These soon abandoned the Conan Doyle material and developed the story out like a complex serial, even went back into the history of the Baskerville family. One of the directors Richard Oswald attempted a further German remake The Hound of the Baskervilles (1929). Other versions include a lost silent French version The Hound of the Baskervilles (1914); the first American version, the silent The Hound of the Baskervilles (1920) with Ellie Norwood; a lost British sound version The Hound of the Baskervilles (1931), written by thriller writer Edgar Wallace; another German version The Hound of the Baskervilles (1936); The Hound of the Baskervilles (1939), the first of the series of Sherlock Holmes films featuring Basil Rathbone; the celebrated Hammer version The Hound of the Baskervilles (1959) with Peter Cushing as Holmes and Christopher Lee as Sir Henry; a two-part adaptation as part of the tv series Sherlock Holmes (1964-8) also starring Peter Cushing; a tv adaptation The Hound of the Baskervilles (1972) with Farley Granger as Holmes; the unfunny comedic version The Hound of the Baskervilles (1978) with Peter Cook and Dudley Moore respectively as Holmes and Watson; a six-part BBC mini-series adaptation The Hound of the Baskervilles (1982) with Tom Baker as Holmes; a routine Canadian-made tv movie The Hound of the Baskervilles (2000) with Matt Frewer miscast as Holmes; and an excellent British tv version The Hound of the Baskervilles (2002) with Richard Roxburgh as Holmes. The story was also given an interesting modernisation in the BBC’s Sherlock (2010– ) tv series, which set it around a bacteriological research facility, and in the Hounded (2016) episode of Elementary where it is set around the murder of a financier by a ghostly hound.